Turns out that even while Google has been sweet-talking automakers to get its software platform into their cars, it had set up a subsidiary to compete with them, the Guardian reports. Google Auto LLC is registered as a passenger vehicle manufacturer, and was licensed last year as a carmaker in California. 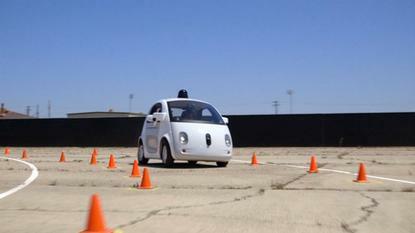 It's run by Chris Urmson, project lead for Google's self-driving cars. Google wouldn't talk to the Guardian, which uncovered the company registration via documents it requested under the public records act. After apologizing last year for working conditions which may have exposed employees to carcinogens, Samsung is now creating a 100-billion-won (US$85 million) fund to compensate sick workers and their families, and to work on prevention at its chip and display factories, Reuters reports. Workers have blamed cases of lymphoma and leukemia on radiation or chemicals exposure in Samsung factories. The iPhone maker may be getting ready to follow Google's lead and launch its own-brand mobile phone service, Business Insider reports. Like Google, it would piggyback on existing carriers via a mobile virtual network operator (MVNO) service. Apple is in talks with providers in the U.S. and Europe, the site said. The twist is that Apple's SIM would switch between carriers to get the best service at any particular place and time -- but it could take five years before it's launched to the public. Cybercriminals appear to be increasingly using online ad networks to deliver their malware payload to unsuspecting web users, and now it's Yahoo's turn to scrub its network of ads that may have exposed users to a ransomware infection for six days. Yahoo said Monday it had removed the malware a day after its discovery by security researchers at Malwarebytes. How is Intel spending the $300 million it committed earlier this year to improving diversity in its workforce? Well, some of that cash will go to employees who refer women, minorities and veterans for employment: they will get twice the usual referral bonus, or up to $4,000, the Wall Street Journal reports. Hackers are using a serious vulnerability in Mac OS that was revealed last week to install malware, including adware, Ars Technica reports. There's little that users can do until Apple comes out with a patch for the privilege-escalation bug. And at the Black Hat conference later this week, security researchers will detail an improved attack on the firmware in Apple computers, using the Thunderbolt connector, that makes them vulnerable to hard-to-detect malware without even being connected to a network. The Department of Homeland Security has expressed concerns about how the Cybersecurity Information Sharing Act (CISA) will compromise privacy safeguards, in a letter sent to one of the U.S. senators opposed to the legislation. Authorizing businesses to share cyberthreat data with any federal agency could sweep away key privacy protections, Alejandro N. Mayorkas, deputy secretary of the DHS, wrote in a letter to Senator Al Franken. President Obama's original proposal for cyberthreat sharing called for information to be routed through a central clearinghouse under DHS control; without that central point, it could also be harder to coordinate threat response, the DHS official said. Undercut by low-cost upstarts, Apple has fallen to third place in the world's largest smartphone market. It's now behind Xiaomi, in the lead, and number-two Huawei, in second-quarter stats on China compiled by research firm Canalys. Samsung, once top-ranked, has tumbled to fourth place despite the launch of its newest flagship phone, the Galaxy S6. Chinese consumers are buying more phones from homegrown vendors whose wares are cheaper than Apple's and Samsung's but come with similar specs. You can survive the move from Windows 8.1 to Windows 10: PC World has the essential guide. Farming could be one of next big markets for technology companies seeking to cash in on the Internet of Things, says the New York Times.